Non-polar and polar covalent bonds both belong to the three categories of polarity as well as the two types of covalent bonds. All three types (ionic, polar, and non-polar) are classified as chemical bonds wherein there is a force (electronegativity) that allows the attraction of the atoms of two particular elements. The number of possible covalent bonds is determined by the number of vacancies in a particular element’s outer shell of electrons. For some consideration, the three categories of polarity or bonds are ionic bonds and covalent bonds. Further classification of covalent bonds reveals these two types. Both non-polar and polar covalent bonds occur in two different and non-metal elements. Both classifications also deal with the distribution and sharing of electrons as well as the resulting electronegativity. When two elements combine, some of the electrons from both elements can be transferred between each other. The electronegativity, or the ability of one element to attract and capture the other element’s electron, is essential in determining the kind of bond between the two elements. The transfer or attraction can cause either equal sharing or unequal sharing of electrons. Polar covalent bonds are characterized by atoms with uneven or unequal numbers or the sharing of electrons between the two electrons. The electronegativity of both elements is different and not equal. Another characteristic of a polar covalent bond is having a molecule with a negative charge on one side and a positive charge on the other. A partial charge is also a defining trait of this particular covalent bond. The molecules in this type of bond also have a defined axis (or axes) of partial positive and partial negative. On the other hand, non-polar covalent bonds have equal or nearly equal sharing or distribution of electrons between two elements. Non-polar covalent bonds have no defined axis or axes compared to polar covalent bonds. When placed on a classification scale, the ionic bond (the bond that exists between a metal and a non-metal) has the most electronegativity and polarity. The ionic bond is followed by the polar covalent bond and, lastly, the non-polar covalent bond. The polar covalent bond can be considered as partly ionic because it can still have polarity. Meanwhile, the non-polar covalent bond is the opposite of ionic bonding. Since the elements in the non-polar covalent bonds have little to no possibility of attracting or pulling away electrons from another element, there is little to no possibility of attracting other electrons from another element. 1.Polar and non-polar covalent bonds are two types of bonds. They both fall under the category of types of bonds that also includes an ionic bond. 2.The covalent bonds (non-polar and polar) are classified as bonds that occur in non-metallic elements, while ionic bonds occur in the combination of metallic elements and non-metallic elements. 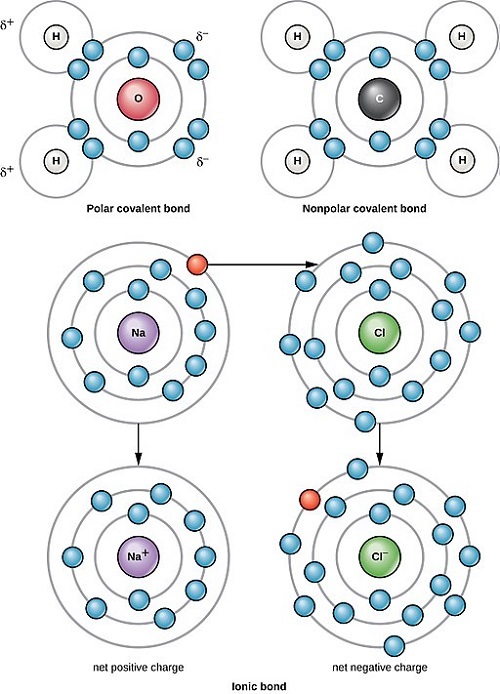 3.Some of the related concepts regarding polar covalent bonds and non-covalent bonds are electronegativity (or the measurement of how two elements share or distribute electrons within each other) and polarity. 4.Polar covalent bonds are characterized by having an unequal distribution of electrons of two elements. They also retain a positive and negative pole, which allows them to have certain electronegativity. On the other hand, non-polar covalent bonds are described as having electrons that are similar or nearly equal in terms of number of electrons. This characteristic makes them have none or less electronegativity. 5.Polar covalent bonds have a defined axis or axes, while non-polar covalent bonds lack this particular feature. 6.Polar covalent bonds have a charge (from having both positive and negative poles), while non-polar covalent bonds lack the charge. Celine. "Difference Between Non-Polar and Polar Covalent Bonds." DifferenceBetween.net. February 26, 2018 < http://www.differencebetween.net/science/difference-between-non-polar-and-polar-covalent-bonds/ >.